The New York City Police force has just noticed a new type of traffic making dangerous rounds across the city. If you’ve crossed Broadway recently, you may have noticed them too, occupying a third green lane home to a flow of terrifying Joseph Gordon-Levitt’s flying at top speed trying to escape from who I presume to be Lance Armstrong, post-doping. Also, you may have noticed the cyclists’ influx into the city hasn’t exactly just been random. Mayor Bloomberg, over the past five years, has invested $11 million in creating bike lanes, which help to fight pollution and alleviate the number of users of the ailing MTA subway system. The number of bikers has multiplied in that time, doubling from 2006 to 2010. All that growth has still only created about 216,000 bikers a day, which is fractional at best compared to the 5.2 million daily subway riders. Despite the size of the increase, it has certainly been steady and shows no signs of slowing. It seems cops are just now noticing this new form of income traffic and, boy, are they having a field day enforcing such heinous crimes as rolling across an empty intersection at a red light, not wearing a helmet, or having a bag on handlebars. You know, the kind of crime our police force should be spending their time on.A ticket for crossing an empty intersection at a red light can cost up to $270, no small sum for a person just trying to find a cleaner, more active form of transportation outside of the nightmarish MTA.The number of these tickets handed out recently have skyrocketed in the past year, with 3,708 handed out in 2009, 9,345 in 2010, and 13,843 in 2011 alone, according to the New York Post.Adding to the issue is the fact that cops have ticketed riders for actions that are not illegal in New York City, like “failing to stop, entering roadway from private road, driveway, alley, or curb,” which is nowhere written as a law or even an infraction for the city. Not everyone is unhappy about this crackdown though; in fact, many New Yorkers are rejoicing over the restrictions placed on what they deem to be reckless riders. And certainly, there have been numerous incidents of bikers hitting people, especially in areas where the streets don’t have separate bike lines.At first, those numbers seem to be quite staggering. According to statistics released by the DMV, in 2012, 15,465 pedestrians and cyclists were injured in New York City alone, and 155 were killed in traffic.It is important to bear in mind though, that most of these accidents, especially the ones causing fatalities, involved a moving vehicle. In fact, according to city data, cars are still 365 times more dangerous to pedestrians than cyclists. 365. This may seem obvious: of course cars are much more dangerous to pedestrians than bicycles. In fact, it would also seem obvious that cyclists themselves bear most of the risk when they ride, putting themselves in a precarious situation fighting for space between notoriously crazy cabs and buses. It would follow, then, that the cities laws should be focused less on punishing small bike crimes, and spend more time ensuring their safety, compounded with cracking down instead of vehicular crimes and accidents. Adding more bike lanes would seem a natural solution. However, there looms an even larger debate, inciting the people who don’t think there should be bikers in New York City in the first place. 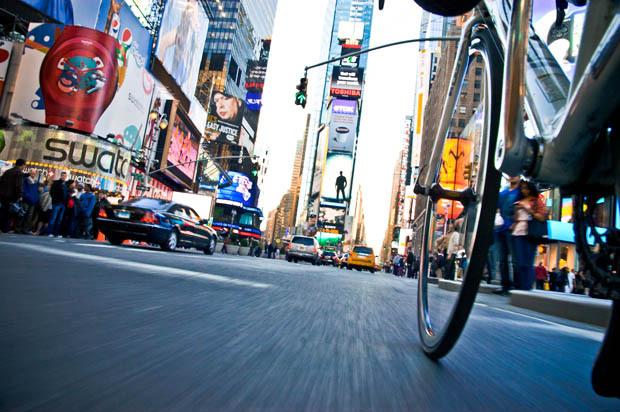 In a 2011 article for New York Magazine, entitled “Is New York too New York for Bike Lanes?” author Matthew Shaer came to the conclusion that, yes New York and bike lanes are incompatible. Profiling residents of the Park Slope area that recently received a new bike lane, he found the people to be resistant to the change they deemed unworthy of its physical ugliness for the little bike traffic it received. With statistics like the ones above about cyclist fatalities and the rise in tickets of considerable amount given to those bikers who break trivial rules, who can blame people for not wanting to hop on a bike with their lives riding on a precarious, fixed gear, metal frame. Certainly some of these new wave commuters deserve the curtailing, but there are many other riders who understand the rules and follow them appropriately, and even then it would seem that some of them are being unfairly punished. It is unjust that those seeking an environmentally friendly, not to mention, healthy alternative to travel should be receiving all the negative criticism that they do. Cheaper, safer, and cleaner than cars and cabs, and at this rate maybe even the subways, it may be time for New Yorkers and their police force to make some room in the hearts and on their streets for bikers. And who knows, we may even get some exercise on the way.